Having written about the diatoms I found in the Ganges headwaters a week or so ago (see “Diatoms from the Valley of Flowers”) I now travel about 250 kilometres downstream, descending 3000 metres in the process, to the holy city of Rishikesh on the Ganges itself. As in the Valley of Flowers, I had time and space for a single sample, and scrambled down to one of the many ghats, toothbrush in hand, to get a sample (and amuse the locals). You can see a photograph of me collecting the sample at the end of “A cautionary tale”. The ghat I chose was just under water at the time of collection, but the water level was fluctuating throughout our visit, so it might have been deeper at times, and probably fully exposed for periods too. As we were in Rishikesh towards the end of the monsoon period, the chances are that it spent more time submerged than exposed in the weeks before our arrival, but I cannot be sure. My sample comes from the flat surface of a concrete ghat, roughly at water level at the time I visited (the river was running across my feet as I sampled) but the biofilm on the surface of the ghat was so thin that I wondered if I had any algae at all in my bottle at the end of some ferocious brushing with my toothbrush. The plate below gives an indication of the diversity of diatoms that, despite my forebodings, I found on the slide that I prepared. Of these, Adlafia minuscula var. 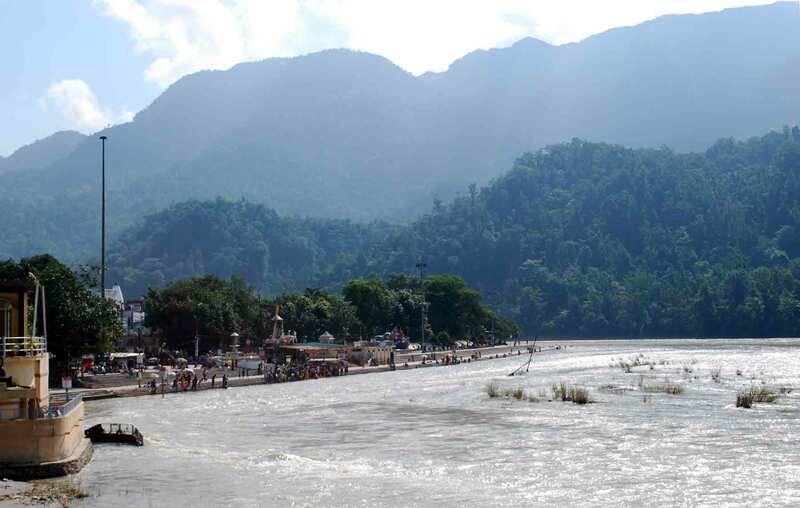 muralis was the most abundant organism and this, along with Nitzschia palea, which was also frequent, suggested that the water at Rishikesh was quite enriched. Halamphora montana, which was also frequent, is a species that can thrive in intermittently wet conditions, consistent with its presence on a ghat that was not fully submerged. In contrast to these, Gomphonema pumilum (which was also frequent) and Achnanthidium minutissimum (rare) are more often associated with cleaner water. 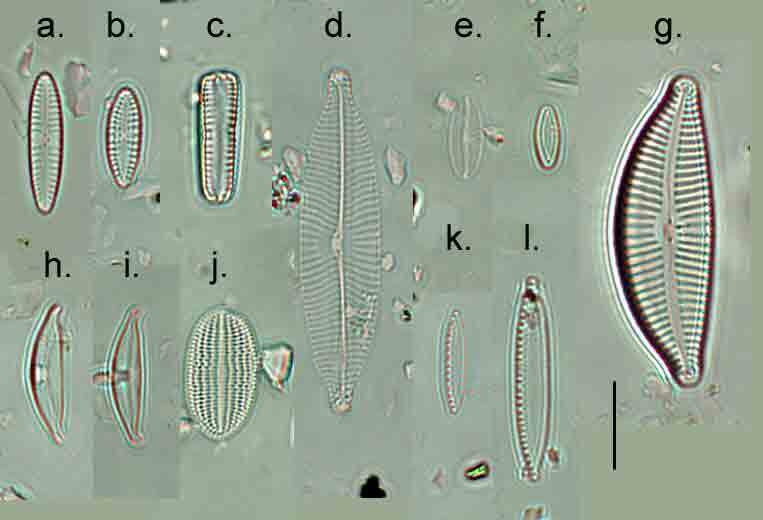 Diatoms from the River Ganges at Rishikesh, September 2016. a. c.: Gomphonema pumilum; d.: Navicula sp. ; e. Adlafia minuscula var. muralis; f. Achnanthidium minutissimum; g. Cymbella sp. ; h., i.: Halamphora montana; j. Cocconeis euglypta; k. Nitzschia cf inconspicua; l. Nitzschia palea. Scale bar: 10 micrometres (= 100th of a millimetre). As you can see from the photograph at the top of the post, and from images in earlier posts, Rishikesh sits just at the foot of the Himalayas, just at the point where the Ganges enters the Deccan Plateau. Were I to turn around and photograph the view in the opposite direction, the landscape would be flat for as far as the eye can see. There is, nonetheless, a substantial population in the Ganges valley upstream of Rishikesh, with several substantial towns, the largest being Srinagar, a city of 150,000 on the Alaknanda tributary. Sewage treatment in these areas is rudimentary so a high organic loading would not be surprising. The low numbers of algae is no great surprise. I recall sampling streams in Nigeria during the wet season and finding very little: the high, scouring flows and turbid water both make conditions difficult for algae at times such as these. The predominance of indicators of poor water quality may also be a consequence of the monsoon, as the heavy rains not just overload the limited sewerage systems, but also wash organic matter into the rivers from terrestrial sources. There is some evidence that water quality is worse during this period than it is during either the pre- or post-monsoon period. There is, however, a belief that the Ganges has peculiar powers of self-purification. I recall Eric Newby writing about this in his classic book Slowly Down The Ganges, and there does seem to be limited evidence that Ganges water has some novel anti-microbial capabilities. I do, nonetheless, wonder at the health consequences of performing an immersive “puja” in such a polluted river. The irony is that the term “pollution” actually has its origins in religion, relating the defilement of holy places by man, so the state of the holy Ganges may have the dubious honour of being truly polluted in both the original and modern senses of the word. Nautiyal, C.S. (2009). Self-Purificatory Ganga Water Facilitates Death of Pathogenic Escherichia coli O157:H7. Current Microbiology 58: 25-29. Tareq, S.M., Rahamen, S.M., Rikta, S.Y., Nazrul Islam, S.M. & Sultana, M.S. (2013). Seasonal variation in water quality in the Ganges and Brahmaputra River, Bangladesh. Jahangirnagar University Environmental Bulletin 2: 71-82. This entry was posted in Uncategorized and tagged diatoms, Ganges, pollution, Rishikesh, rivers. Bookmark the permalink.